This report analyses the baking enzymes market by geography, types, and applications. Geographically, the report is segmented into North-America Asia-Pacific, Europe, and Rest of the World. 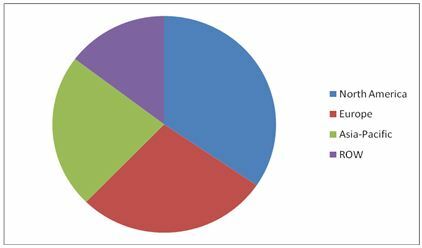 The types of baking enzymes included in this report are carbohydrase, protease, lipase, and others. The applications covered in this report are breads, biscuits & cookies, and cakes & pastries. The purpose of using baking enzyme in various applications may differ depending on the intended health benefits and functional characteristics of the ingredient. The report estimates the global baking enzymes market size in terms of value and volume. It discusses the market drivers, restraints, and opportunities. The report also tracks the recent strategic activities of market players such as product launches, expansion plans, and partnerships and collaborations. This report highlights the major functions of baking enzymes such as dough improvement and dough stability, long shelf life, prolonged softness & freshness, crumb structure and better appearance. 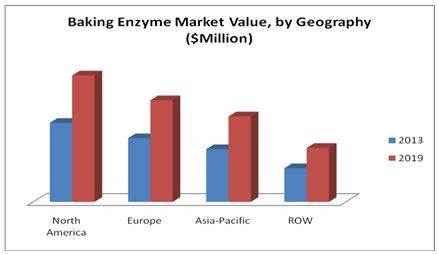 The report also estimates the market size of baking enzyme, based on type and application, in the key markets: Europe, APAC, North America, and Rest of the World (ROW). According to the estimation, the global market is expected to reach $695.1 million by 2019. In addition to market forecasts, the report also highlights key opportunity areas for relevant stakeholders; analyzing market trends, opportunities, drivers, and inhibitors for the market. In order to provide a deeper understanding of the competitive landscape, the report profiles the key players of the baking enzymes market, and provides market tables, categorized into geographic regions, types and applications. The global baking industry is fast inculcating the use of enzymes in light of the numerous advantages they present. The enzymes considered in this study include carbohydrases, proteases, lipases, and others (asparaginase, glucose oxidase, lipoxygenase, etc.). Baking enzyme find application in diverse end-use markets like breads, cakes & pastries, biscuits & cookies, among others. Baking processes stand to become more environment-friendly with the use of baking enzyme as they account for low greenhouse gas emissions and less raw material wastage. With the advent of new production strains using genetically modified microorganisms, large scale manufacturing of baking enzymes is possible, with functions aimed at specific requirements without the risk of undesired side-effects. The three broad applications of baking enzymes include breads, biscuits & cookies, and cakes & pastries. The figure above highlights the shares of North America, Europe, Asia-Pacific, and Rest of the World in the global baking enzymes market.